“Life is uncertain. Eat dessert first.” ~Ernestine Ulmer. And if I may complement this piece of prudent wisdom “… start with a pavlova!” Because after you have tasted this true piece of heaven, whatever may come after that will just be consolation in the form of dessert. I can remember everything about my first bite of a fresh fruit pavlova. After spending a blissful day discovering the treasures of the Notre Dame cathedral and getting lost in fantasies and tales my friend interlaced to keep me engrossed throughout the morning, he suggested we go for dessert! C. was from Brest and came to Paris to study Art History and Fine Arts at the American University of Paris. I came to the university to study French and literature for their 3 month summer course. We met during a long lazy lunch a friend had organized and ended up having a heated debate about the American way of life versus the savoir faire of France. C. was enamored by the big easy America seemed to portray and for me France, Europe in general, was the doorway to everything I wanted to learn, to inhale and to live - art, history, literature, style, cuisine - it had all I desired. As we crossed the Pont d’Arcole leaving the Notre Dame cathedral behind us, I was imagining éclairs, Tarte au Chocolate and Charlottes, turning to C. and trying to guess what I would be indulging in. The last thing I remember was passing by the Centre Georges Pompidou, after which C. and I got involved in another one of our heated discussions. He led me down a small winding street and finally we stopped at an inconspicuous little bistro at the corner of a street. He went inside as I took a seat on one of the free tables outside. Coming out with big bowls of creamy café au lait he informed me that I was going to taste heaven. I was breathless at the sight as the waiter placed the plate and offered me one of the two spoons. A light caramel colored meringue, distinctly cracked and beautiful in its imperfectness. The crisp shell with a luscious marshmellowy, chewy center was topped with lashings of, ever so lightly sweetened, whipped cream and spilling over the plate ruby red raspberries and deep blue blueberries shimmered in the afternoon sun. If ever the heavens should open and beam an incandescent ray of sunlight directly on my head and a chorus of heavenly angles sing in all their glory, that would have been the perfect moment as I savored my first bite of a pavlova. It was the most delightful experience to say the least. I went on to learn how to make pavlova in the hotel pastry kitchen during my Hotel Management training. Taking in all the intricacies and noting all the dos & don’ts of making a perfect pavlova. Every time I do make a pavlova I silently thank C. for sharing this memorable experience with me. Truth be told though, making a pavlova is not rocket science and by no means should one be intimidated by the lengthy recipes. 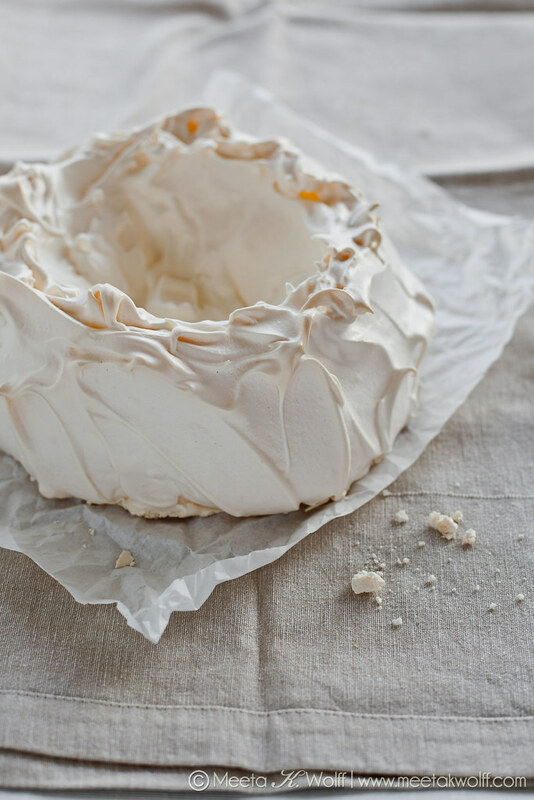 There are just few tips and tricks one needs to keep in mind, but I urge all those who have been shying away from making a homemade pavlova - dive in and dare. To help you along I’ve noted these tips and tricks for you here. For every 1 egg white you use in your meringue you should calculate 55g of sugar. The addition of cornstarch / cornflour and vinegar helps create a soft marshmallow center and a crisp crust. Fresh egg whites separate easier so make sure they are as fresh as can be. Make sure you use a clean and dry bowl while whisking your egg whites - any grease or moisture will stop your eggs from aerating. Overbeating egg white breaks down the structure and the meringue is most likely to collapse during baking. Beat until firm peaks form, then start adding sugar. If the egg white starts to separate or looks curdled - it’s too late: you'll need to start again with fresh egg whites. The sugar needs to be added gradually, occasionally scraping down the side of the bowl. Once all the sugar is added, whisk for a further 2-3 minutes or until the mixture is thick and glossy. Make sure that the sugar is completely dissolved, as undissolved sugar causes "weeping". This happens when moisture forms on the meringue, so if the mixture is grainy, continue whisking. If you overbeat the mixture after adding the sugar, your meringue may crack and collapse during baking. To avoid this, only beat the mixture until the sugar dissolves. To test this rub a little of the mixture between your fingertips. I usually draw a circle on the back of my baking paper as a stencil, which helps keep the meringue in shape. Use a palette knife to pull the meringue mixture upwards around the edge to create furrows. This helps support the sides of the pavlova, and prevent it from cracking too much and collapsing. I make a well in the center of the meringue so that it looks almost like a bowl. This is perfect to hold the filling comfortably. After baking the meringue according to your recipe, turn the oven off. Leave the meringue in the oven, with door ajar, for up to 6 hours to cool completely. If you remove the meringue when it's still warm it will cool too quickly, and may crack and collapse. Some people like their meringue really dry and airy, for which you would leave it in the oven, with door ajar, overnight. Or you can pull it out a little earlier, leaving the center gooey and chewy. The meringue may be made 2-3 days ahead and stored in an airtight container, but the pavlova should be filled only shortly before serving as otherwise it will get soggy and lose it’s crispness. When it comes to fillings your imagination is the limit! The classic pavlova will be filled with a cream Chantilly (lightly sweetened whipped cream) and topped with an assortment of fresh fruit like kiwis, strawberries, blueberries. Most fruits love pavlova, so do not hesitate to use fresh peaches or plums, sliced pineapple chunks, passion fruit, mangoes or a combination of fruit. If you do not fancy fruit for a topping there are many other choices. Try nuts or a combination of nuts and coarsely chopped chocolate. I have even made a breakfast pavlova topped with granola! You can also use mascarpone, fruit curds and preserves for your pavlova - no limitations. @sipsandspoonful: @MeetaWFLH rhubarb compote! Pr berries and passion fruit! @thelittleloaf: @MeetaWFLH lemon curd cream + raspberries or poached pears, hazelnuts & dark chocolate or vanilla bean cream, kiwi + passion fruit! @TLTLittleThings: @MeetaWFLH Chocolate base with cream and raspberries is still my favorite! Your pavlova looks gorgeous! and finally do not miss Catty’s divine pavlova with strawberries, blueberries and passionfruit. it seems we both had pavlova on our minds this weekend! Thank you to all who replied with your awesome ideas! My pavlova today is a special treat for Chris of Mele Cotte, who is my gracious hostess for the Monthly Mingle this month. Chris has chosen the perfect theme to welcome Spring along with “Berries & Cherries”! 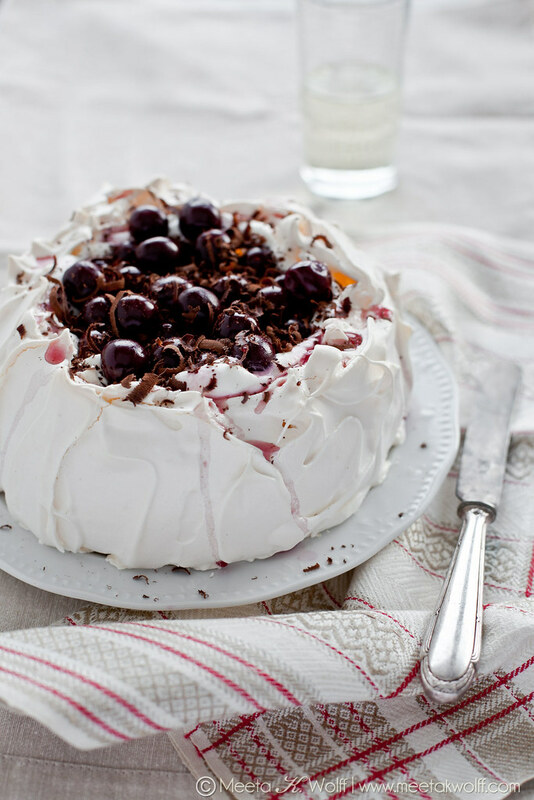 The Black Forest Pavlova is my twist on the famous German cake, the Schwarzwälder Kirschtorte. I make a basic meringue and fill it with a light quark cream flavored with Kirsch. I top it with sweet, plump Morello cherries, which also have been macerated in Kirsch, finally shavings of dark Lindt chocolate kiss the pavlova for a decadent touch! This would be the perfect dessert for your Easter brunch or dinner. Before I let you loose on the recipe, allow me to inform you that due to two unexpected cancellations two spots have freed up on our Plate to page Workshop in Somerset this May. These are the last two spots and for those who were eager to come join us but did not make the registration in time you might just be in luck. Have a look at the programme, details about accommodation, and then you can register here. Preheat oven to 175 degrees C. Draw a circle approx. 20 cm in diameter on a sheet of baking paper. Place, pencil-side down, on a baking tray. To make the meringue, whip the egg whites with an electric whisk to soft peaks. Gradually add the sugar, a tablespoon at a time, occasionally scraping down the side of the bowl. Once all the sugar has been added whisk for another 2-3 minutes until stiff peaks form. The mixture should be thick and glossy. Make sure the sugar has dissolved completely and the meringue is not grainy. Add the cornstarch folding gently with a spatula, then pour in the vinegar and the kirsch and fold through. Spoon the meringue onto the baking paper and using a palette knife shape into a circle using the penciled mar as a guide. Pull the meringue upwards around the edge to create furrows, which will support the sides of the pavlova. Make a well in the middle, which will hold the filling. Make sure the base of the meringue is not too thin. Turn the heat down to 100 degrees C and bake the for 1 ½ hours until the pavlova is dry and crisp. Turn the oven off and leave the meringue in the oven, with the door ajar until cooled completely – 4 to 5 hours. Do not remove the meringue from the oven when it is still warm as it will cool too quickly and may crack and collapse. Slide the pavlova onto a plate and spoon the filling into the center. Drain the cherries reserving about 2 tablespoons of the fruit juice. Place cherries in a bowl, pour the reserved juice and 1 tablespoon Kirsch and allow to macerate until the meringue is ready. To make the quark filling mix together the quark, sugar and remaining kirsch. Whisk the whipped cream until stiff and fluffy. Gently fold into the quark mixture. When ready to serve fill the meringue with the quark-cream mixture, spoon the kirsch cherries over the top and sprinkle the grated chocolate. Drizzle some of the cherry liquid over the filling and serve immediately. I cannot begin to explain the feeling of excitement I get every time I take the first bite from a pavlova (providing it is a good one). I guess the choir of angels are always there to sing in chorus even after all these years. This pavlova is a delight. I like to add quark to my whipped cream as it provides a little substance and I really like the slightly tangy flavor it gives. The Kirsch was very subtle even though it is added to all three components and the cherries sweet and juicy. We cut out big wedges of the pavlova, sinking back into our chairs to enjoy each pavlova moment. To you in the Northern hemisphere, hope you are enjoying the gorgeous Spring weather and to you in the Southern hemisphere take in all the gorgeous Fall colors. I’m getting back to working on my presentations for the Dubai workshop and together with Sally sending out the final details to all our participants. We’ve organized a great two day session and thanks to Atlantis, The Palm, who have been extremely generous sponsors, we have an amazing venue in Nasimi Beach. Sally is busy packing the goodie bags, which are bulging with incredible products sponsored by some great companies. On day two we have also planned a fun field trip sponsored by Lafayette Gourmet, who are putting together a great event for us. This will go into the must make soon jar! This can be fun anytime, but for some reason I always think of pavlova in spring. Hmn.... now, if I could just convince Giuliano about meringue. He isn't yet a fan but I do keep trying. 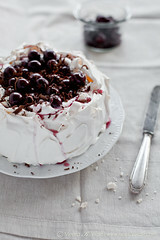 I always use a mix of quark and whipped cream on my pavlova, but those cherries and dark chocolate - mm, divine, Meeta!!! It looks divine and so delectable! I've never had a Pavlova but now it is on my to-do, maybe during summer in france with a filling of fresh apricots and some pistachios. Wow Meeta that is a fabulous pavlova. Well done. I likemy pav with cream and passionfruit. This has to be hands down the most perfect pavlova. Glorious! Oh I *love* pavlova, and I love Paris - what a happy combination! Making your own meringue base is like night and day compared to the tasteless store-bought ones - I love how high you have built up the sides of the meringue "bowl". The flavours of Black Forest cake are so great to play around with - a friend of mine makes Black Forest trifle that's to die for :o) Gorgeous pics as always. What a great choice of topping! This pavlova looks so beautiful. A heavenly dessert. Good choice! I loved seeing the suggestions people came up with on Twitter - this one looks like a real winner - sweet and velvety but not overly rich or ridiculous. Yum. This is gorgeous! I am far too far away from being this talented in the kitchen, but it's definitely something to aspire to! And it looks absolutely fantastic and delicious. Pavlova is a favourite of mine... I have mastered it over the last four decades. Yours looks lovely. Haven't seen a more gorgeous dessert in a long time! I would love mangoes and cream too ! 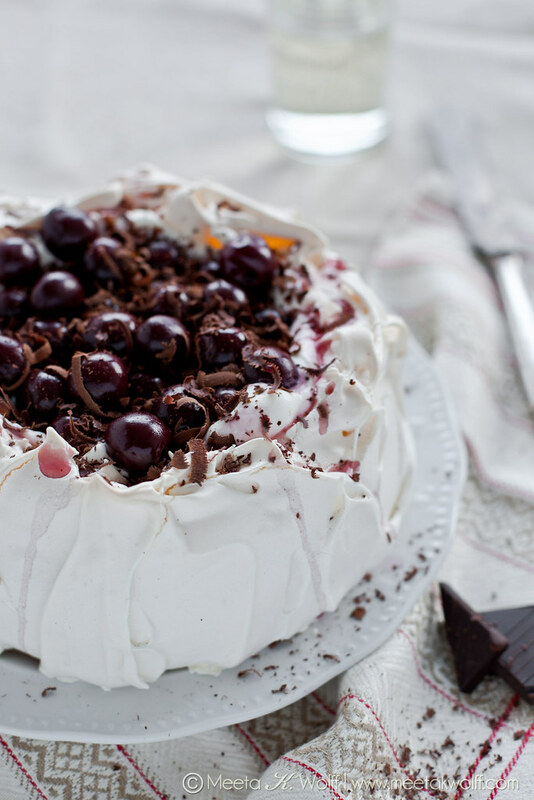 That pavlova, with the cherries and chocolate shavings in the center, is stunningly gorgeous! What a combination of flavors. As soon as I find some good cherries over here I'm giving this a try. Meeta, I'm always dreaming up of pavlova toppings but I have to say this one takes the cake! I love the idea of the black forrest flavours…those cherries and chocolate shavings are calling my name! 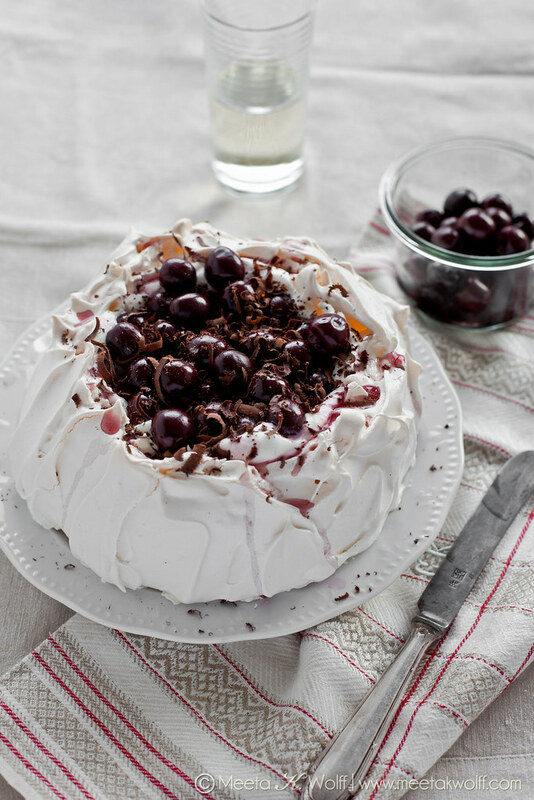 gosh does it get better than black forest topping with that marvelous pavlova?! I think not. Wow!! You really got me with these photos of your sublime pavlova! I must make it this afternoon without failure! Love the shape of this pav! I make them often as I'm a complete show off and love the oohs and aahs as you bring one to the table. The high sides are a really great idea making a bowl for a generous filling. Back to packing goodie bags! I love Pavlova, but I have never thought of making a Schwarzwälder Kirsch version. Absolutely gorgeous! I love pavlova, my husband loves black forest. SO I can't see a reason why I should not be making this! Absolutely gorgeous, Meeta! This pavlova looks so beautiful! I think it's a great choice of topping. Love its cute look. This looks so good and it's so beautiful too! Wow! Gorgeous!!! I never make pavlova because my men don't like meringue! Can you believe it? And if I made this stunning beauty - and oooh chocolate and cherries is my favorite! - I would have a hard time not eating it all myself. Fabulous! And love the story! I love this recipe. Cool pics and description too. Thanks. This is absolutely stunning, Meeta. I love making small meringue baskets (and freezing the extras for last-minute entertaining). Next time I will have to fill them with some of this lovely cherry and chocolate filling. And I have to agree with Carle's philosophy on eating dessert first. The man has his priorities straight! This is absolutely gorgeous Meeta; I'm more of the layered pavlova type but this is so beautiful I think I must try it. You are a master!! This is gorgeous and perfect. I am in awe! That looks so amazingly good! Chocolate and cherries is one of my favourite flavour combos! I've been looking for a pavlova recipe and this looks great - I'll let you know how I get on! This pavlova is stunning...I am not sure what I would dive into first, the berries or the meringue. Can't wait to add it to the Mingle! Thanks so much for letting me host! Such an elegant dessert! And yes dessert first is the way to go. This looks absolutely mouth watering!! Your Pavlova is perfect and the pic sooooo beautiful!! Thank you everyone for your great comments. So glad you are liking the recipe for this pavlova. Cherries are something simply heavenly and when mixed with cream and meringue it's almost like an out of this world experience. Hope you find the tips easy to follow and wish all those trying a pavlova for the first all the best. It's easy - you'll see! Meeta, this is on my long list of things to learn to make. I've pinned this one, your tips are helpful. Thank you for the inspiration. Your pavlova looks AMAZING! The last time I tried making one, it was a disaster, but hopefully, armed with all your tips, I can roll out a better one the next time! Oh My! This looks over the top amazingly, delicious! This pavlova is killing me:) I must make it now...thank you for the great recipe and great photos! You are wellcome on my food & photography blog! This seems to be a tough recipe as we need to be very careful while beating egg. I would prefer seeing it live before attempting to make one. As for the filling my all time favorite chocolate and nuts will do. I changed the Pavlova flavors to chocolate orange with cocoa and orange extract, used Chantilly cream and pieces of orange. Wow! Everyone should make this easy decadence. Thank you for tutoring! Pavalova is actually an Australian dish, not originally from france, and we like to enjoy it traditionally with sliced banana, strawberries, kiwifruit and passionfruit pulp drissled over the top! Best enjoyed after a day at the beach or as desert at a barbeque! A winner Meeta, this one is gorgeous! Cherries are here, so pavlova here I come! Pavlova isn't my favorite type of desert not is it anywhere near my list, but this post made me reconsider as the images alone are enough to make me insanely drool and this hour.